Home / Sharpening Articles / Hunting and Outdoors / Which Work Sharp Sharpener Should I get? What's the difference between the three Work Sharp Power Sharpeners? Work Sharp now has three power sharpeners to choose from, the original Work Sharp Knife Sharpener, The Ken Onion Edition Work Sharp Knife Sharpener, and now the Work Sharp Combo Knife Sharpener. The purpose of this article is to look at the features of each unit to help you choose the right sharpener for your needs. Work Sharp Combo Knife Sharpener - The newest addition to the Work Sharp line, the Combo Knife Sharpener is for those who like their knives sharpened quickly and simply. 25° Fixed Guides - perfect for heavy duty edges on outdoor or hunting knives. 120 Grit Abrasive Belt - makes for fast and efficient sharpening. Built in Ceramic Rod with Reference Guides - allows quickly hones to finish or maintain an edge. Compact Size - for easy storage or transport. Work Sharp Knife Sharpener - The original that started it all, the Work Sharp Knife Sharpener combines flexible abrasive belts with fixed guides to sharpen knives and tools. 20° and 25° Fixed Guides - giving options to sharpeners for different blades. 65° Scissors Guide - scissors used to be difficult, not any more. 3 Abrasive Belts - 1/2" x 12" belts in 80, 220 and 6000 grits to cover shaping to polishing. Ergonomic Handle - makes it easy to use as a bench top or hand held sharpener. Availalble Upgrade to Field Kit - the optional Field Kit includes Retractable Ceramic Hone and a carrying bag. Work Sharp Knife Sharpener Ken Onion Edition - The extremely popular and very versatile Ken Onion Edition has been a best seller since it was introduced. Adjustable Guides - adjust from 15° to 30° in 1° increments for a wide variety of blades. 65° Scissors Guide - don't forget the scissors. 5 Abrasive Belts - 3/4" x 12" belts in P120, X65(P220), X22(P1000), X4(P3000), 6000 grits give a wide range. Wider Belts - 3/4" wide belts are wider than on the Work Sharp Knife Sharpener (6000 grit belt is 1/2" x 12"). 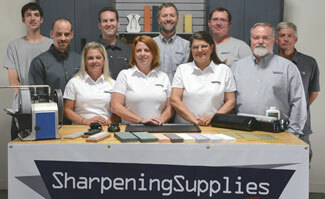 Easy Belt Access - sharpen a wide variety of tools easily. Locking Switch - lock the power switch in the on position for easier operation. Variable Speed - gives greater control. Optional Accessories - the Blade Grinding Attachment and the Tool Grinding Attachment make it possible to sharpen just about any tool. Not everyone has the same needs from a sharpener. Some sharpen knives for outdoor use. Others for the kitchen. Some have both of those and more. But whatever your needs, Work Sharp has a sharpener for you. Questions on Work Sharp sharpeners?